Game Data Live can be used in many scenarios. You can implement a little or a lot. You can start out simple and move up to complex when you're ready. Implementation is flexible. 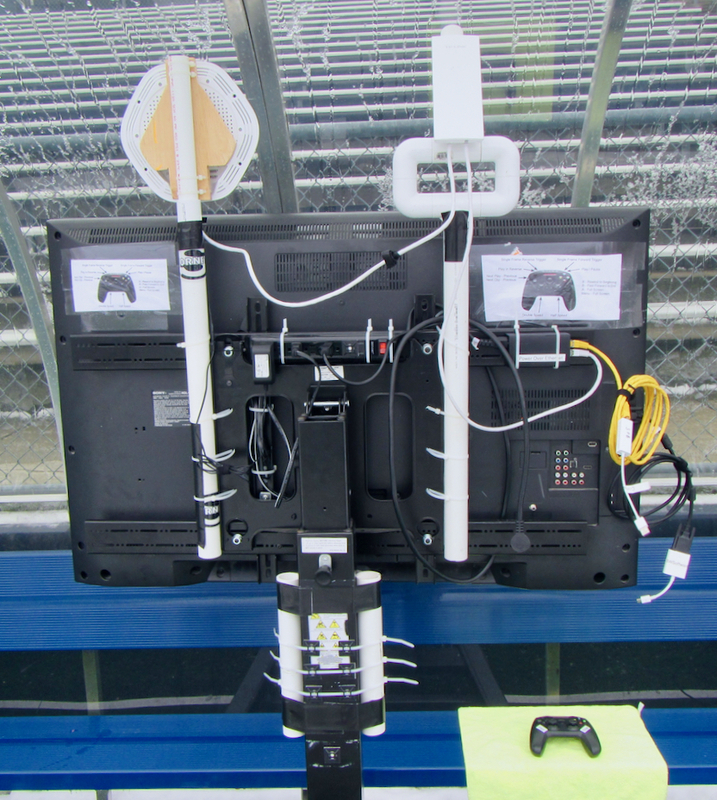 Saline High School in Saline Michigan is the primary test site for Game Data Live. At Saline we have used Game Data Live since 2014 in a variety of scenarios. We started gathering data and video with iPads and running the iPads to the sideline. We added wireless networking to distribute the video and data in the press box and on the sideline. We added iPhone support because they often had better cameras than iPads. 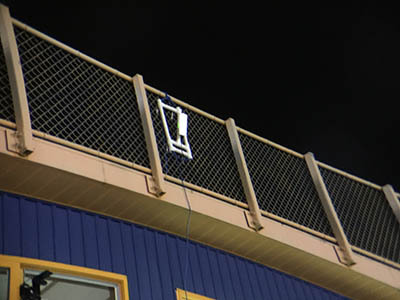 We upgraded to a two tier wireless network to avoid interference with cell phones during a game. We added an end zone camera to provide two camera angles. In 2017 we added Macintosh support and eliminated as much WiFi as possible. 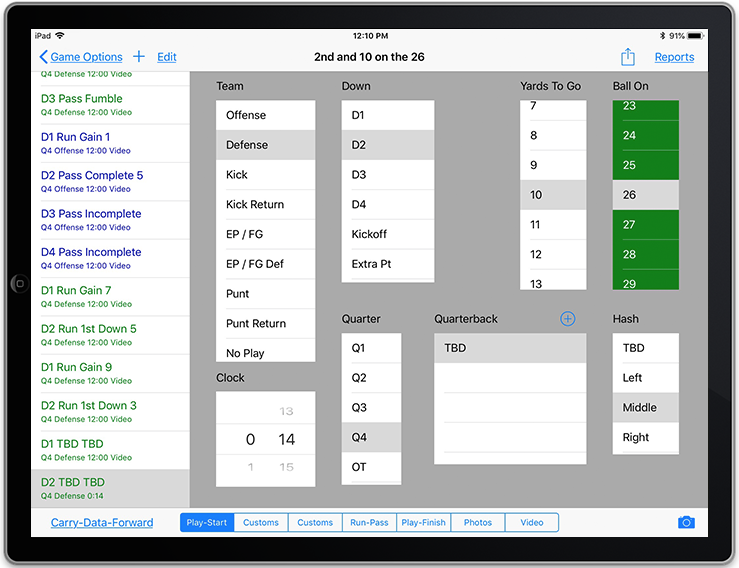 A team statistician can use Game Data Live to gather play data. With the iPad's touch interface and scrolling lists for data entry, you can enter a lot of data fast. The data can be imported into Hudl after the game. You can enter a little data or up to 24 variables per play. The Hudl export can include 21 variables. Stats and Scouting Reports can be viewed or transmitted as PDFs by email or using AirDrop to coaches or the media. You'll be surprised how fast data entry is. Several Game Data Live customers have gathered data since 2014 including an Arizona state champ. That Arizona state champ has used Game Data Live for 4 seasons, winning 3 out of 4 state championship games. Networking within the pressbox is relatively simple. 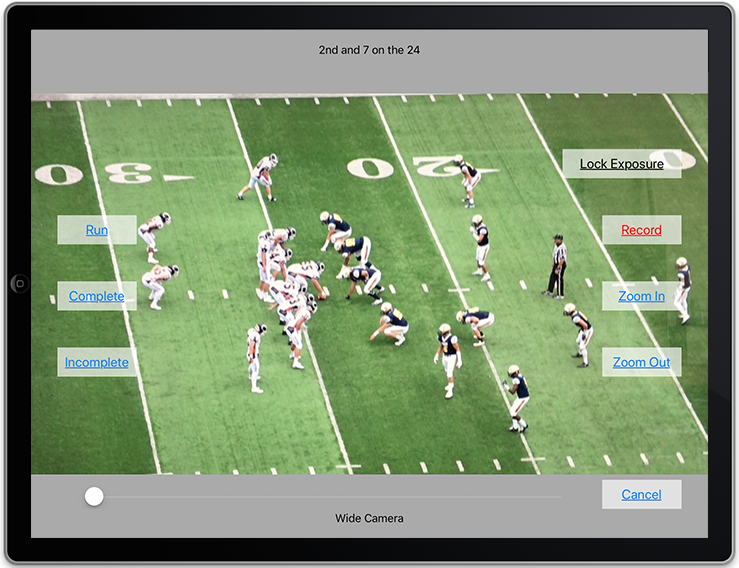 One person can shoot video and enter basic data and another can view it in the pressbox. Coaches see a play list for the entire game and can easily find plays and their video from the last possession. The person shooting the video can use an iPad, iPhone or a Macintosh. Use a router to provide a network between your devices. 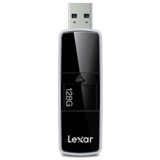 Use a flash drive in the router to provide a file server for the network to make video transfers faster and to support multiple video receivers. If one of your devices is a Macintosh, it can also be the file server with the addition of some free software. Any network connections that can use ethernet wire instead of WiFi will improve network reliability. Add a directional wireless access point to your network. 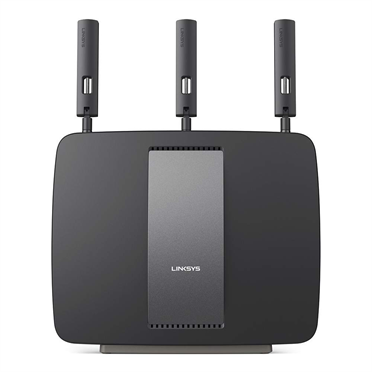 We use a TP-Link CPE510. Point it at the sideline so you can provide strong signals there. It connects to the router with an ethernet cable. Power is provided over the ethernet cable. Its directional signal is about 45 degrees wide. Add a couple access points on the field. A 2nd TP-Link CPE510 is pointed at the one on the press box to create a very strong two way link over the spectators with the cell phones. This is easy to implement if you have a television on the field to mount the CPE510 on. A third access point is used to distribute WiFi to devices on the sideline. The one shown above the television is a Linksys LAPAC-1200. It connects to the CPE510 with an ethernet cable. The yellow ethernet cable connects to a Macintosh laptop. The black display cable on the right also connects to the laptop. A game controller can be used to operate the laptop remotely. To add a second camera in the endzone, use another TP-Link CPE510 to get your signal to the top of the press box. 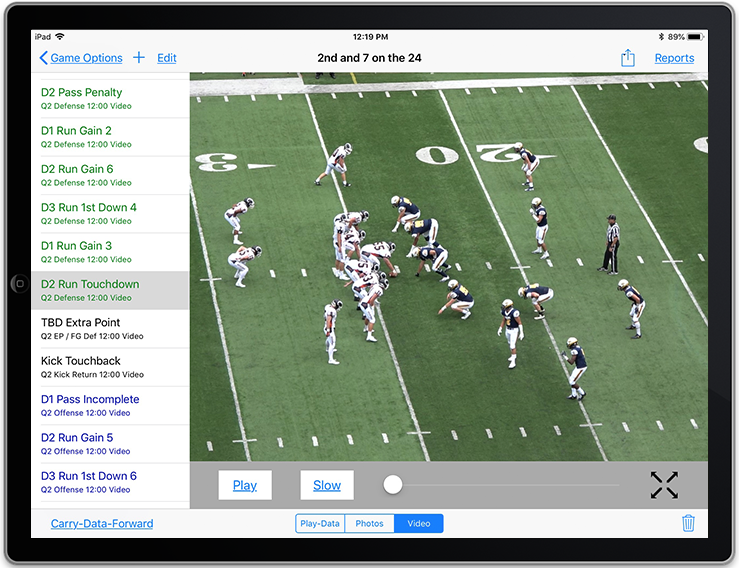 Capture endzone video with an iPad or better yet - use a Macintosh with a framegrabber and a traditional camcorder. The camcorder will work much better from the endzone than an iPad because it can actually zoom to the other end of the field. Connect your iPad or Macintosh to the CPE510 using an ethernet cable. 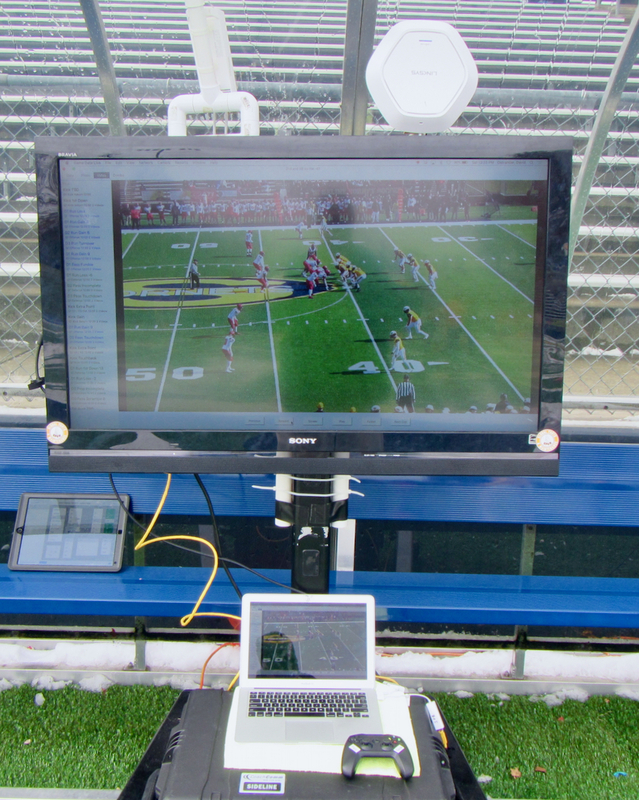 In 2018, Saline High School has used a more powerful transmitter (TP-Link CPE610) in the endzone. It has helped us deliver end zone video to the pressbox reliably. 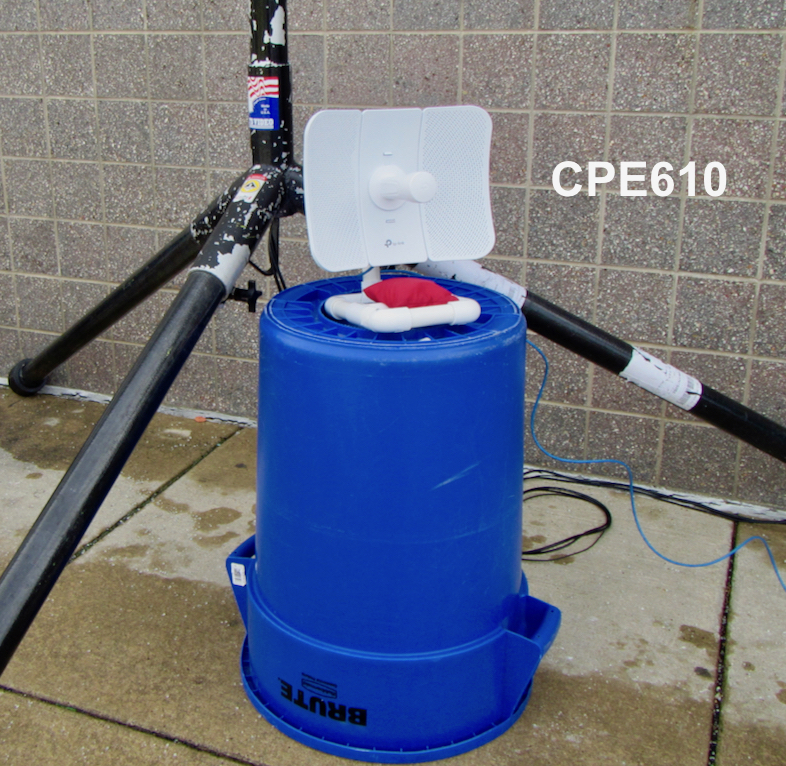 The CPE610 has a 9 degree beam width and transmits a more powerful signal than the CPE510.